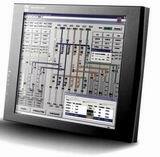 Automation Control Systems developed by Damcos company provide complete monitoring and control of ship equipment. System can be extended to the complete integrated solution Damcos Marine Tank Management. Generally, Damcos MTM is an intelligent system solution for complete monitoring and control of a ship's tankrelated functions. Radar tank level measuring, cargo temperature and vapor pressure monitoring. Ballast and Service tanks level measurement using pressure sensors or electro-pneumatic system. Valves remote control - hydraulic system or electro-hydraulic (local hydraulic system installed on the actuator - LPU system). Cargo operations control and monitoring from one of workstation in CCR or on the Bridge. The Damcos automation control systems are based on a customer-specific system configuration which ensures optimum installation and performance.